Louisville has torn down so many buildings over the years that it sometimes starts to dull the senses. This one, however, really hurts. It’s not as monumental as the demolished old Post Office & Customs House or as high profile like the Columbia or Lincoln Buildings, but it’s unique. I had never seen this structure before and it is from another part of Louisville of Louisville that was nearly completely leveled. 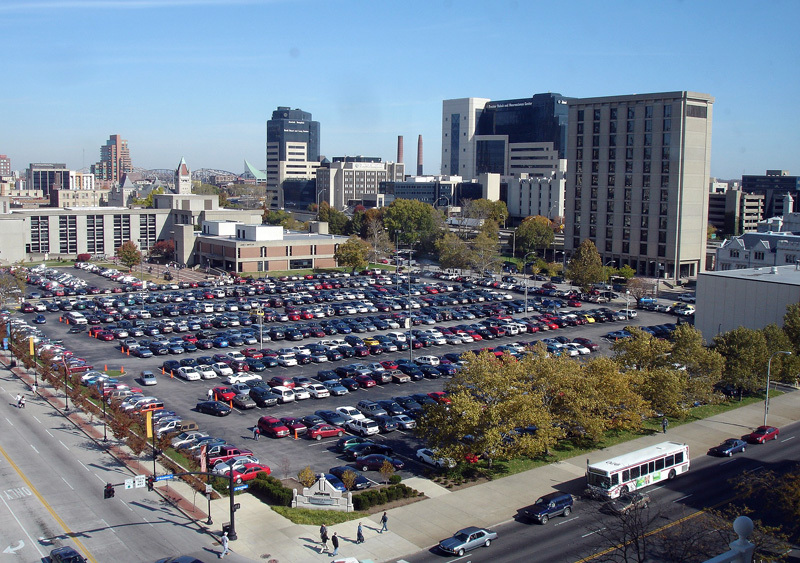 Originally located on the southeast corner of Second and Gray streets, this structure, and in fact its entire block, has been converted into one giant surface level parking lot. Some may be noting that Gray Street doesn’t intersect Second Street, but years ago it reached Second before it was cut off at First Street. Now it’s an access road in the JCTC mega-parking lot. Before our love affair with the bulldozer, however, this area was a pleasant residential neighborhood. Because this is simply an apartment building, I couldn’t find a whole lot of history about it. I’m not sure when it was built, but it does appear on an atlas of Louisville in 1876. The historic photos seen here were taken in 1948, so it at least lasted into the modern era. Architecturally, this five-story apartment house is a type rarely seen in Louisville. It’s an urban row building in a city dominated by single family houses and it features French influences such as its Mansard roof. It featured wrought iron balconies and was built of two colors of brick and stone. A stone base level contained retail space, taken by a dry cleaner in the late 1940s. Above, two-story brick pilasters in a light brick are set off in a dark field. The building is crowned with a slate Mansard roof. This type of building is important for creating a human-scaled urban environment, but now there are too few examples of historic residential structures. In 1876, the neighborhood was mixed-use but predominantly residential. It must have had the feel of a slightly more urban Old Louisville. Neighboring this structure, and, of course, also torn down were two schools (German English Academy and the 6th Ward School), the large Broadway Church, and houses and mansions of various sizes both attached and free-standing. Seeing these losses hurts my heart. Louisville didn’t get “it” then and seems to be equally clueless today. How many “world class” cities are full of empty lots and gaps where great structures like this once were? This mansard roof building is evocative of many buildings in Paris, ironically enough the result of a massive urban renewal project in the 1800’s. I wish the architects and builders and developers would take some pride in what they build and quit leaving faceless boxes and weedy lots for future generations to sigh over. Thankfully, in this case all is not lost. 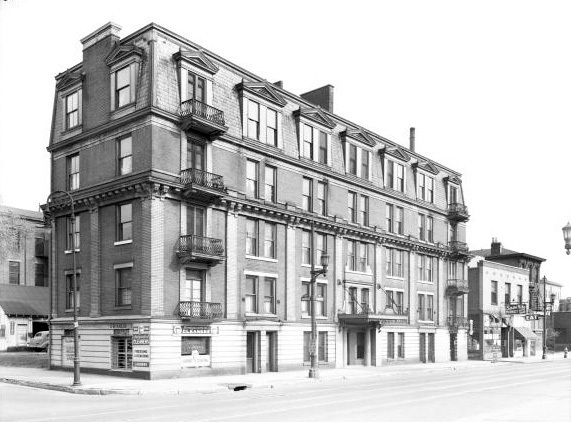 A spectacular (by Louisville’s standards anyway) example of the Mansard roof can still be found on the corner of East Main and North Hancock Street. This building, however has me worried; it sits directly across the street from an old ice warehouse that I believe is planned to be demolished under the ORBP I-65 expansion plan. Is this building to be spared, or will it suffer the same fate? The roof on Billy Goat Strut is a good example of a Mansard in Louisville, but a city that prides itself on the French connotations of its name should have far more than one example of the prototypical French roof style on an urban building. St. Louis, for example, has more Mansard roofs that it knows what to do with. Interestingly as well, the BGS building was originally an industrial building while the above example was always residential. Strange how much care people put into making all types of buildings presentable. Also, at some point taller pointy roof lines on the BGS were removed. I’ll post an etching of the original at some point.